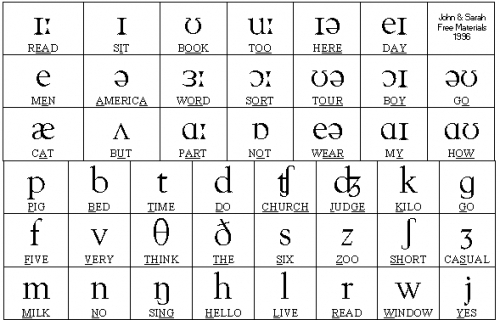 I have studied a little bit better the Phonetic Alphabet and I think it is so important that everyone whom start to study english ought to check this alphabet. What is the Phonetic Alphabet? It is very simple, it is the structure of the word's sound in english. So if we learn to hear the correct pronunciation since the beginnig of our studies english, we would improve a lot our understanding of the spoken language. I have noticed the diference betwen using the P.A. and without it. I feel sure when I'm talking, I can express better ideas due to better pronunciation and are very clear all my words. It is very important to have persistance when you study it. You need to LEARN to HEAR. Hear one an another time till it's clear. So, my best wishes to you if you are learning to speak english. "practice until you get it"
I forgot to writte that every dictionary has the pronunciation of the word at the begining, so, you will be able to practice the pronunciation without a teacher.